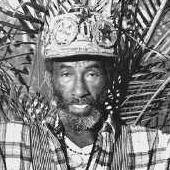 Rainford Hugh Perry, aka Lee Perry, aka Scratch, aka The Upsetter, was born on 28th March 1936 in Hanover, Jamaica. He began his musical career working for seminal producer Coxsone Dodd during the late 50s and early 60s, acting as a record scout, organising recording sessions, and later supervising auditions at Dodd's record shop in Orange Street, Kingston. By 1963, as well as handling production and songwriting for Delroy Wilson and the Maytals, Perry had released the first of his own vocal records through Dodd. In 1966, Perry fell out with Dodd and began working with other producers including Sir JJ Johnson, Clancy Eccles and, in 1968, Joe Gibbs, for whom he wrote songs and produced artists such as Errol Dunkley and the Pioneers. In 1968, Perry set up his own Upsetter label in Jamaica, again with help from Clancy Eccles. Immediately, he began having hits with David Isaacs and the Untouchables, and, in common with other early reggae producers, secured a contract with Trojan whereby his records were released under his label in the UK. Perry experienced his first taste of UK chart success with tenor saxophonist Val Bennett's spaghetti western-inspired title, "Return Of Django", which spent three weeks at number 5 in the UK charts during October 1969. At the same time, he began producing the Wailers on a series of records including "Small Axe" and "Soul Rebel" which are now considered to be among that group's finest work. Just over 100 singles were released between 1969 and 1974 by artists such as Dave Barker, Dennis Alcapone, the Stingers, Leo Graham, Big Youth, and the legendary Junior Byles. From 1972-74 Perry slowed down the rhythm and consolidated his position as one of the leading innovators in Jamaican music. In 1974, Perry opened his own studio, dubbed the Black Ark, situated in his backyard at 5 Cardiff Crescent, Kingston. From 1975 he began to employ studio technology, notably phase shifters and rudimentary drum machines, to produce a dense, multi-layered mixing style that is instantly recognisable, and eminently inimitable. It is all the more remarkable for the fact that all this was achieved in a four-track studio. By 1976, Island Records had begun to release the fruits of this latest phase, including music by the Heptones, Max Romeo, George Faith, Junior Murvin, Prince Jazzbo, and the Upsetters. With his commercial success becoming increasingly infrequent, Perry's frustrations and personal problems began to increase. He was still making wonderful records, but his style was now far removed from the reggae mainstream both in Jamaica and abroad. The culmination came in 1980 when he famously torched his studio and left for Europe. After living in the Netherlands in the mid-80s, he eventually moved to London. This low period also coincided with the vacuum felt internationally in reggae music following the death of Bob Marley. It wasn't until the second half of the decade when he teamed up with Adrian Sherwood and Style Scott's Dub Syndicate on the celebrated albums "From The Secret Laboratory" (ON-U LP52), and particularly "Time Boom X De Devil Dead" (ON-U LP43), that his artistry began to shine again. Around the same time he started working regularly with South London's Mad Professor, and so it continues to this day. In 1990, he moved again to Switzerland and married a Swiss millionairess. He also returned to Jamaica to begin rebuilding the Black Ark. In 2006, after a gap of more than 15 years, Perry started recording with Adrian Sherwood once again, and a new album, "The Mighty Upsetter" (ON-U CD1001(2)), subsequently appeared two years later in a release that was also described by some critics as another return to form. Whatever the future holds, Lee Perry, the man Bob Marley once described as a "genius", has already made one of the most individual contributions to the development of Jamaican music, as a producer, arranger and writer, and also simply as a singularly powerful guiding force during several of its crucial phases.